views A and B). The water seal prevents gases and odors from the sewer from coming into the building or structure containing the floor drain. Drains without a water seal (fig. 5-34) may be used when the floor drains are connected in a system that feeds into a storm sewer system. A floor drain that is 2 inches is rated at two drainage fixture units. 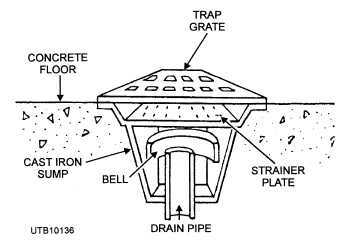 A floor drain that is 3 inches is rated at three drainage fixture units. The load of fixture units for floor drains is added to the sanitary system, not the vent system. Most code requirements do not require floor drains to be vented if they are installed within 25 feet of a vented drainage pipe line. Clean, hot water is required in many installations for domestic and industrial use. Since boiler water cannot be used for this purpose, because of the chemicals added, it is necessary to heat additional water. The water may be heated in tanks equipped with coiled piping through which the boiler water or steam circulates. Or it may be heated in independent units that heat by electricity, gas, solar, or oil. Domestic water heaters are built in various sizes from 20, to 50-gallon capacities. Industrial type of water heaters are designed to heat thousands of gallons of water, depending upon the amount and use. Figure 5-34. - Drain without a water seal. and 50 inches, depending upon their capacity. The tank is constructed of galvanized sheet metal, which may be lined with a composition of glass to resist corrosion of the tank lining and prevent contamination of the water. The combustion chamber is in the lower section, which is vented by a baffled flue that extends through and ends at the top of the tank. The entire tank is insulated to prevent the escape of heat. It is also equipped with a thermostat which can be adjusted to maintain a certain water temperature. Safety features which make the hot-water heater automatic are also in the unit. Both the cold-water inlet and the warm-water outlet are at the top of the tank. These tappings are usually marked "INLET" and "OUTLET." However, if there is a question in your mind as to which is the inlet and which is the outlet, just remember that the cold-water inlet pipe extends over halfway into the tank, but the outlet pipe does not. There is usually a drain valve at the bottom of the tank. You must ensure the dip tube is installed on the cold-water side or inlet to allow the cold water to go to the bottom of the heater and not cool the water at the top. Gas water heaters must be installed with a relief valve normally located in the top of the shell. The relief valve is set to open on a temperature or a pressure rise of an unsafe limit. Relief valves differ from a safety valve in that a relief valve opens gradually at a set point. Normally the valve opens at 210 degrees or at 125 psi at a minimum. The pipe that carries the relieved water or steam from the tank must extend to within 18 inches of the deck to prevent a hazardous condition. Always remember that water in a closed vessel, when heated, will expand and cause the pressure to rise. If, for some reason, a control fails to turn the heat source off, the pressure will be relieved by the relief valve. The water that comes out of the outlet of a relief valve will flash off due to the pressure change, and you will experience a hot steam discharge along with very hot water. Q1. What term is used to refer to measurements used to set water supply and sewer drainage piping? Q2. One fixture unit is equal to how many cubic meters of water per minute? Q3. Using table 5-1, how many fixture units will be used to install two bathtubs, three water closets, and a slop sink?